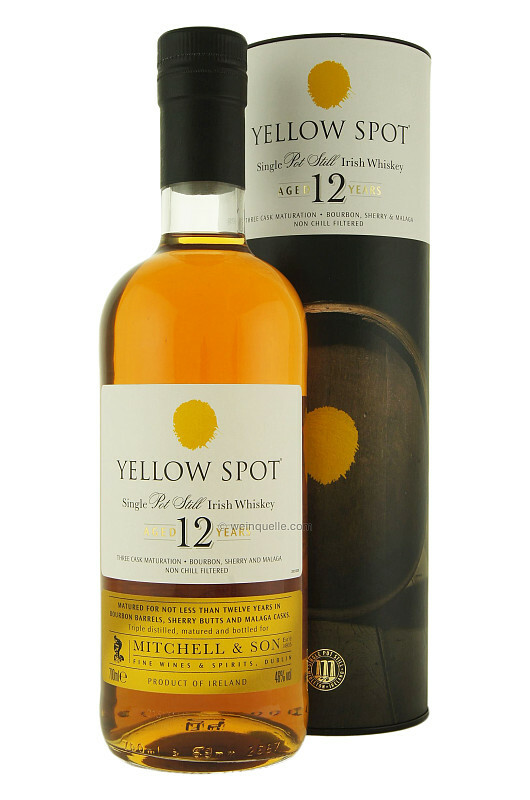 Yellow Spot Single Pot Irish Whiskey 12yo (46.0%): This whiskey is technically a relaunch of the old Yellow Spot which was a member of Dublin's famous wine merchants Mitchell & Son's single pot still range throughout the first half of the twentieth century. As you know only surviving expression of this line-up used to be Green Spot and due to its limited release and unavailability at certain markets it reached an almost mythical fame, especially in the States. While the sales figures of whisk(e)y is skyrocketing all over the world and the well deserved appreciation for single pot still whiskey rising every day Irish Distillers Pernod Ricard couldn't find a better time to release Yellow Spot to add next to it's younger sibling Green Spot. The whisky is distilled in Middleton Distillery and aged 12 year long separately in American oak ex-bourbon barrels, Spanish oak ex-sherry butts and Spanish oak ex-Malaga casks. Then they all got married together to create the Yellow Spot. This bottle is from the first the first batch of only 3,000 bottles which was released last spring. The new batch is on its way. Before we start I want to say that I really liked the short pudgy bottle. It's kind of funny. Color: New polished copper, clean perfect amber color. Nose: First sniff is like sticking your nose into a huge fruit bowl: Baby bananas, nectarines and peaches topped with orange blossom honey and vanilla seeds freshly scraped out of the pod. Then sweet malt, cookie dough and carrot cake frosting. Rose jam..! Now adding a splash of water and ooops..! It washed almost everything away... Weird, nothing left... You should be very careful with the water, literally a few drops only. Palate: Initially the spiciness of unmalted barley steps up but still with vanilla sweetness and wild flower honey. Like a beautiful quince jam cooked with mild spices: cinnamon, nutmeg and cloves. Creamy but not thick in texture. Drops of water make it definitely more accesible, delicate and almost floral but again just a few drops. Finish: Spicy as I would expect from a single pot still whisky but not peppery more with cloves and nutmeg. All rounded by honey and candied orange zest notes. Overall: It's a totally different whiskey than the Green Spot, no comparison needed. It's rich, rounded and bold. Very enjoyable but not so much your everyday dram. It would pair great with a mild and easy going cigar. It's a beautiful whiskey, no doubt about it but I am more like a Green Spot guy I guess.